Pilsen Alliance convened the meeting after residents told the group about The Gentry, a new loft office and retail development on the corner of 18th Street and Sangamon Street owned by John Pagone of Villa Capital Properties. Many took the name of the development, a reference to the British genteel society of the eighteenth century, as a “slap in the face” for the thousands of Pilsen residents who have been displaced by the recent influx of mostly white professionals in the area and subsequent higher rents and mortgages. About three weeks before, Pilsen Alliance had sent letters to Pagone, Alderman Danny Solis of the 25th Ward, and the building’s listing agents, Zach Pruitt and Michael Nelson of NelsonHill, a real estate agency, inviting them to attend the meeting. None of them came. Pagone, who originally said he’d attend, pulled out at the last second, claiming that since NelsonHill wasn’t attending, there was no point in him being there, either. Solis was later confirmed to have been at McCormick Place watching President Obama’s farewell address instead. Esquivel was flustered. Dozens of people had already congregated at the library, expecting to air their concerns to the community’s major stakeholders. She apologized to the crowd for their invited guests not showing up, but informed them that the meeting would go on anyway. “Let’s use this time to talk about how we feel about this building and what we can do about it,” she said. The meeting then became an organizing effort, with members of Pilsen Alliance guiding the conversation as to how best combat The Gentry and all that it represents. Ramirez-Castaneda’s optimism is ubiquitous among the members of Pilsen Alliance. She is the first to admit that when it comes to working for affordable housing and other issues important to Pilsen, “it’s as hard as it’s ever been.” But for an organization used to waging battles against millionaire developers, coal power plants, and an uncaring City Hall, the present-day struggles don’t just represent one of Pilsen Alliance’s biggest challenges; they’re also the Alliance’s time to shine, and another opportunity to establish the community its members wish to see. Pilsen’s history is defined in large part by displacement and resistance. In the 1950s, thousands of Mexican residents living in the Near West Side were displaced to make way for the Eisenhower Expressway. Residents held their ground until the last possible moment, but many were dislocated and moved into Pilsen. More Latinos were pushed into Pilsen by a southward campus expansion of the University of Illinois at Chicago (UIC) in the early 1960s. Again, residents did not go quietly: on March 19, 1961, hundreds of Mexican protesters took to the street, deriding Mayor Richard J. Daley for selling them out. Once again, however, their voices were ignored. One month later, City Council designated 106 acres for UIC. Today, Pilsen’s longtime residents are suffering through another round of displacement. According to a study by John Betancur and Youngjun Kim of UIC, more than ten thousand Hispanic individuals left Pilsen between 2000 and 2013, representing a quarter of the neighborhood’s total residents, while the number of white residents grew by twenty-two percent. The roots of this new round of gentrification stretch back to 1997, when UIC expanded southward yet again and when City Hall created the Pilsen Industrial Tax Increment Financing (TIF) District aimed at jumpstarting industry in the area. Activists and community leaders expected these twin developments to drive up the price of living in the area and lead to the displacement of families living on the east end of the neighborhood. As a response, they organized a Community Congress for Pilsen in 1998 in order to develop a strategic plan for community preservation. Out of that plan came Pilsen Alliance. Since then, the organization has fought and won numerous battles in the name of protecting its community from wealthy outside forces and idle politicians. Pilsen Alliance’s philosophy is simple: Defend the community at all costs. That mission, however, has become increasingly difficult. The pressures driving displacement across the neighborhood are in full force, and with Solis hurting more than helping their cause, Pilsen Alliance has found itself with few allies in high places. Ramirez-Castenada, however, finds hope in the one place it is most needed: the community. Lorena Vargas, a single mother of two, first came in contact with the group when her mother was losing her home last year. While unfortunately her mother wasn’t able to keep the house, Vargas became more involved with Pilsen Alliance, and is now part of the group’s community board. 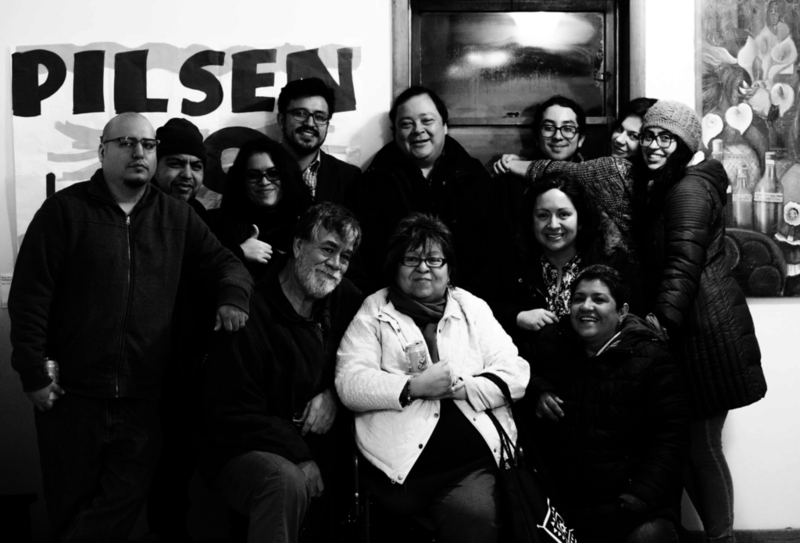 Pilsen Alliance made its name through its work on affordable housing and educational equity, issues that, according to Ramirez-Castenada, are still the group’s main focus. However, since its inception, Pilsen Alliance has also dedicated itself to creating alliances and coalitions with other social justice groups that work to make Chicago a better place for its people. Most recently, members of Pilsen Alliance traveled to Standing Rock in protest against the Dakota Access Pipeline, disrupted Mayor Rahm Emanuel’s Martin Luther King Day breakfast, and helped organize the massive demonstrations across the city the day of President Donald Trump’s inauguration. Chicago’s most prominent adopted son centered his farewell address on the fractured state of our democracy and called on all of us to do something about it: “If something needs fixing, then lace up your shoes and do some organizing,” he said. It’s a philosophy that’s driven Pilsen Alliance’s work for two decades. So impressed with this article! Well-researched, great narrative. Thank you! I completely understand your Resistance. I don’t understand what is happening with a group of your followers spray painting graffiti, speaking unprofessional, ignorantly, giving the finger to patrons, and threatening people. Is this what Pilsen is about? Is this how you want people to assume the neighborhood is? The neighborhood is turning as most neighborhoods do. I believe Pilsen is a wonderful neighborhood and is growing and becoming a place people want to visit and be patrons to your stores and restaurants. Why do you think this is OK?